The SDG Book Club will curate young readers’ books correlating with each of the UN’s Sustainable Development Goals over 17 months. 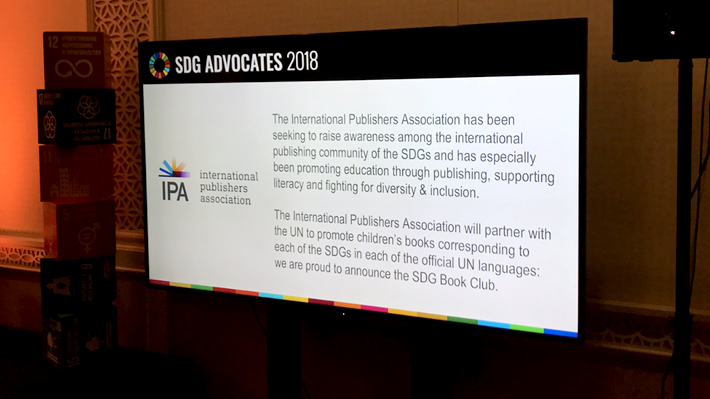 At the start of “UN Week”—the 73rd session of the United Nations’ General Assembly, to run through October 1, the International Publishers Association (IPA) and the UN Outreach Division are announcing the creation of a Sustainable Development Goals Book Club, the “SDG Book Club,” for young readers. 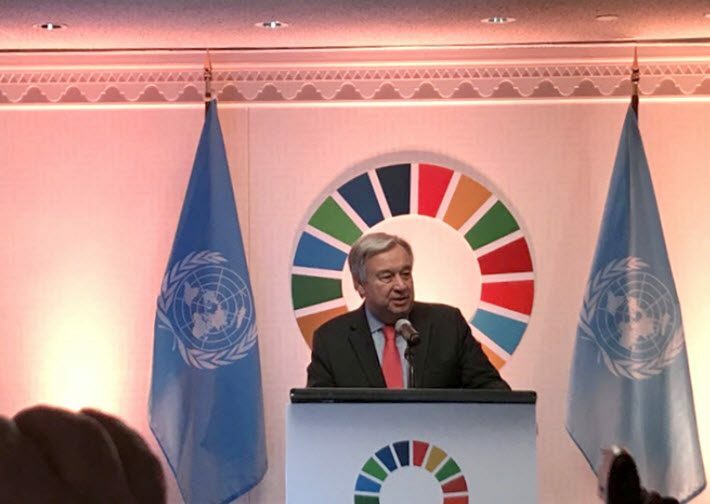 The formal announcement was made Sunday evening (September 23) at an event launching several Sustainable Development Goal initiatives. The UN secretary-general António Guterres was on-hand, as was the Norwegian prime minister, Erna Solberg, and International Publishers Association president Michiel Kolman. The UN’s 17 Sustainable Development Goals (SDG) were put into place in 2015 and came into force in January 2016. Those goals are the pillars that anchor the UN’s 2030 Agenda for Sustainable Development. The concept of the new book club’s development is meant to support all 17 of the goals. In fact, the program is scheduled to run for 17 months. Each month, the club is to create a curated reading list of titles that will encourage children and YA readers to engage with the goals. 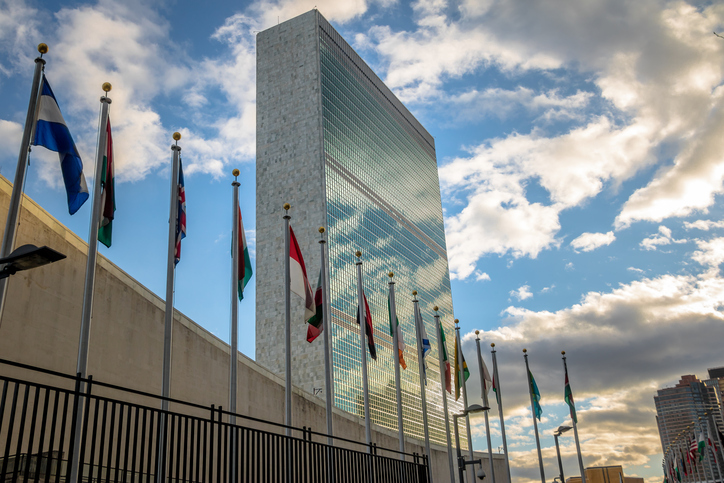 Initially, six titles are to be designated each month, one in each of the official languages of the United Nations—Arabic, Chinese, English, French, Russian, and Spanish. In a prepared statement from New York City, the publishers association’s president Kolman is quoted, saying, “Imagine children in Asia reading about diversity and inclusion in Chinese [and] kids in South America enjoying Spanish-language books on the importance of water in their lives. “All children should have the opportunity to learn about and shape their world through the prism of the Sustainable Development Goals. We are convinced that the goals are attainable by 2030, and we hope that we can contribute” to achieving that target. Kolman was in New York last week as the Association of American Publishers held its annual meeting, and was joined by IPA vice-president Hugo Setzer—who is expected to succeed Kolman as president this winter—and by IPA secretary general José Borghino. As New Yorkers brace for the annual gridlock and street closures that affect the East Side of Manhattan annually during the General Assembly, many diplomats and NGO operatives at the General Assembly will be watching for comments relative to the Sustainable Development Goals from speakers. By tradition, Brazil has spoken first since 1947, followed by the United States, as host country. Agreement is due by December on the so-called Paris rulebook, which will describe nations’ steps in monitoring their attempts to act on climate change. Speaking for the Outreach Division of the UN, its director, Maher Nasser, is quoted, saying, “Knowledge has always been a key to progress, and books, in any form, are the means by which knowledge is preserved and shared. “Our collaboration with the International Publishers Association on an SDG Book Club is an important initiative to reach children and youth with books and stories in multiple languages that introduce them to the Sustainable Development Goals and the importance of action to achieve them. At the point of today’s announcement, details have yet to be provided about how the Sustainable Development Goals Book Club’s reading list(s) will be curated, nor whether the books selected will include both fiction and nonfiction. The plans are expected to be fleshed out in coming weeks and months. To follow various agenda points of the General Assembly, see the UN Journal. More from Publishing Perspectives on the International Publishers Association is here, and on children’s literature is here. At Frankfurt Book Fair, the International Publishers Association will present an event on October 12 at 10:30 a.m. in the Weltempfang Salon (Hall 4.1, B81) titled “Accidental Campaigners and International Diplomacy.” The session will bring together family members of two IPA Prix Voltaire award winners, Gui Minhai’s daughter Angela Gui and Raif Badawi’s wife Ensaf Haider, in conversation with IPA’s Kristenn Einarsson—who heads the association’s Freedom To Publish committee—and moderator Peter Craven. More on the session is here. 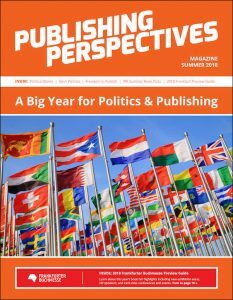 Our Summer Magazine is ready for your free download and is themed on politics and publishing. It includes our extensive preview of the Frankfurter Buchmesse. Download the PDF here.